(Robin Hebrock Pahrump Valley Times) – It was an evening of sadness and solemnity but also one of laughter and smiles as residents from around Pahrump and the surrounding areas celebrated the life and legacy of Dennis Hof. 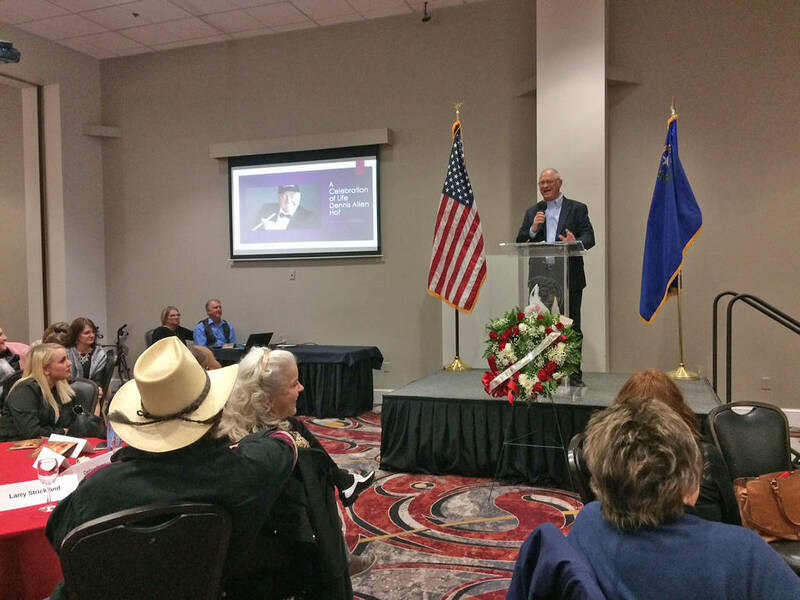 A memorial service in Hof’s honor was hosted Nov. 16 at the Pahrump Nugget Events Center, exactly a month to the day after he passed away. Hundreds turned out for the event, packing into the venue to reminisce with a mingling of tears and mirth. While Hof may no longer be in this world, it was more than evident that he would live on in the hearts of all those who knew and loved him. Nye County Republican Central Committee Chairman Joe Burdzinski opened the ceremony, offering a welcome before pastor Victor Fuentes gave the invocation. Speakers were then called forward and Nye County Commissioner-elect Debra Strickland started things off, followed by a full dozen others. Throughout the nearly two hours of speeches, memories came fast and thick while tears sparkled in eyes burning with emotion. From anecdotes and tales of a personal nature to recollections of Hof’s perseverance and political triumphs, the theme wound through all described Hof as a kind, generous man who was loyal to his friends and always willing to reach out to help others. Mark Risman, an attorney who regularly represented Hof in business matters, spoke next, followed by former Assembly District 36 representative Ed Goedhart, Hof ally Tina Trenner and a former employee who was very close to Hof, Paris. Renae Goedhart, leader of the Nye County Republican Women, Terry Svejda, Nye County Commissioner-elect Leo Blundo, Zack Hames, Republican party treasurer John Prudhont, Nye County Commissioner Donna Cox and Hof campaign manager Chuck Muth rounded out the list of those offering words in Hof’s honor Friday night. While remembrance captured much of the moment, those celebrating Hof’s life were also looking to the future. Many took the opportunity to encourage residents to help ensure Hof’s legacy is continued by voicing their opinion in the matter of who will be appointed to fill the Assembly District 36 seat that Hof won in the 2018 general election. Some simply called for the selection to be made with Hof’s conservative values and principles in mind while others came straight out to announce their backing for Burdzinski, who is just one of those putting forward his name in pursuit of the appointment. An “I Stand With Joe” petition was also circulated that evening, allowing memorial attendees to sign their names in formal support of Burdzinski and public opposition to outgoing Assemblyman James Oscarson, whose seat Hof was to take in 2019. Hof’s death created a vacancy and Oscarson, according to various news sources, has stated his intention to submit an application seeking appointment to the seat. The proposal was one that obviously frustrated many local GOP members and the petition sheets rapidly made their way around the crowd. The petition goes on to entreat the Nye County Commission to appoint Burdzinski to the position, outlining a series of reasons, including Burdzinski’s close friendship with Hof and the support he has within the Nevada Republican Party and Hof’s campaign team, as well as his belief in low taxation and limited government. The selection will be made by the Nye, Clark and Lincoln county commissions in early December. Applications for the appointment are being accepted until Nov. 26. Hof was born Oct. 14, 1946 and passed away Oct. 16 at his Love Ranch brothel in Crystal. He was laid to rest on Nov. 5 in South Lake Tahoe, California.